From Axis Drone, a company that specializes in making nano drones designed for beginner drone enthusiasts, comes Aerius, world’s smallest drone ever. Pre-programmed “Trick-Mode” Algorithm Provides Amazing Flips and Rolls! Super Portable, Fun, Unique and a Great way to Practice Flying Drones Indoors! 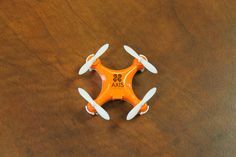 Thus, the Aerius is designed to be a fun, practice indoor drone for novice drone flyers. And while bigger drones such as those used by photo companies for their aerial photography services continue to grow in demand, nano quadcopters may soon rival their popularity due to its basic functionality, safety and affordability.